Kenyan born, Robert has developed a close relationship with the Samburu of the Kipsing area in Northern Kenya, an affinity that has spanned over 18 years. This has allowed him to capture rare and private moments amongst a people that are usually inhibited by photography. Furthermore, his own sensitive personality is expressed in these beautiful images. Robert operates a successful safari business running luxury mobile tented safaris and this unique lifestyle has enabled him to pursue his passion for photography over the years. 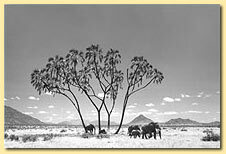 His photographic work has attracted worldwide acclaim. For the past four years he has been voted Kenyan Photographer of the Year. He is married to Angela Sheldrick, the artistic daughter of two famous parents, the late David Sheldrick, the founder Warden of Kenya’s Tsavo National Park, and Dr Daphne Sheldrick, famous for the rearing of orphaned infant elephants as well as many other orphaned animals. He has two sons, Taru (named for Tsavo) who is three years old, and Roan, aged one.